In my constant reading of blogs, I've discovered a rainbow trend. Lots of the ones I've seen have been created with inks and paints...but you know me. Clean hands = happy card maker. So I made my rainbow by adhering colored card stock triangles to a black circle. That rainbow circle went behind my white card card stock that had a smaller circle cut into it. 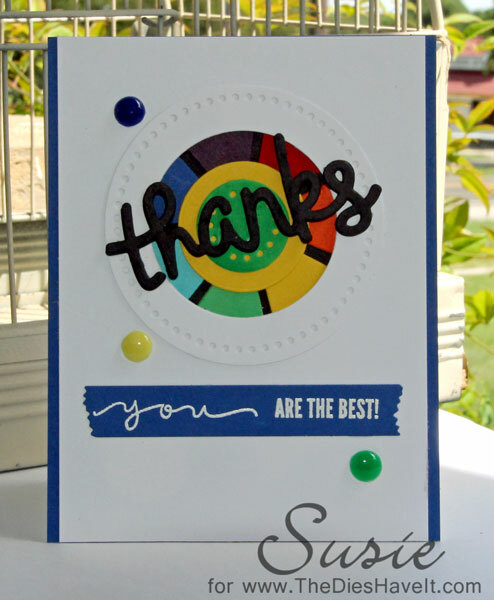 Then I layered on another twice die cut white circle as a frame...and then two more circles in the middle of my rainbow. I used the Nesting Circle dies from Little B to construct this. They are unique ones that not only cut, but also cut out little tiny circles too. Check them out right here. I can't remember where the THANKS die came from....I'm amassing lots of word dies these days. But I know the blue Washi tape banner is from MFT Stamps and the sentiment is from Simon Says Stamp . I'd been neglecting my homemade enamel dots lately...but knew I needed them to finish my card. The colors were perfect! Thanks for stopping by today. I'll be back tomorrow and I hope I'll see you then.